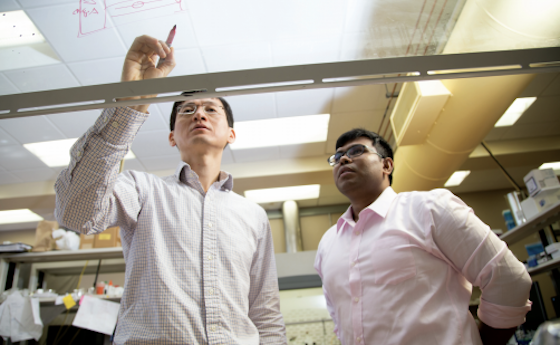 Oregon State University College of Engineering Associate Professor Alan Wang and postdoctoral fellow Siva Shanmugan discuss how to improve the detection sensitivity of diatomite biosensors. Every bite of food we take is an act of faith. The risk increases when food comes from countries with lax food safety regulations. And about 20 percent of our food supply is imported, including 97 percent of our seafood. Violations include histamines and antibiotics in seafood and pesticide-laden fruits and vegetables. Naturally occurring domoic acid can afflict crabs, prompting wildlife authorities to close fisheries when too much of the algae-produced neurotoxin shows up, financially hurting fisherman and disappointing consumers. “Food adulteration is a severe issue in developing countries,” said Alan Wang, associate professor of electrical engineering and computer science in Oregon State University’s College of Engineering. “But inspections are time consuming and expensive.” Searching for contaminants is a two-stage process. Chromatography separates targeted molecules from a food sample, while spectrometry gauges their concentration. One promising technology is surface-enhanced Ramanscattering spectroscopy (SERS), in which a laser is beamed at the sample. The light is scattered at different wavelengths, each one a unique signature for a specific type of molecule, that allows scientists to determine the quantity of each toxin. New biosensors developed in his lab could transform how, and how often, we monitor food-borne contaminants. His twist on the technology pairs a method called thin-layer chromatography (TLC) with state-of-the-art portable Raman spectrometers, and he can pack the entire system onto a 1-inch by 4-inch glass slide. Wang calls it a lab-on-a-chip, and the key is diatomite. Diatomite is a plentiful sedimentary rock made of fossilized diatoms — a marine algae and the smallest photosynthetic plant on Earth. Its skeletons act as photonic crystals, a phenomenon that shows up throughout nature. They’re responsible for the striking colors of butterfly wings and opals, for example. They also resonate light in a way that greatly enhances Raman scattering signals, which means extreme accuracy. To run tests, Wang spreads a thin layer of diatomite on the chip. Then he applies a food sample, which the porous medium absorbs. The toxins he’s looking for will diffuse and separate with the help of a solvent. Next, he conducts SERS to identify the molecules and measure their concentration. It all takes a few minutes. “One of the of the most noteworthy features of this technology is that it can simultaneously perform on-chip chromatography of complex biofluidic samples and acquire the surface-enhanced Raman scattering spectra of the target chemicals with high specificity and sensitivity,” Wang said. And the system’s portability means SERS analysis can be completed with a hand-held Raman spectrometer on site — on a boat or a dock, for instance. The system’s prowess is evident in a study where Wang tested chili powder and oil for Sudan I, a carcinogenic orange-red dye. Because of the diatomite’s photonic crystals, Raman signal intensity increased 10-fold compared with current commercial TLC-SERS techniques that use silica gel. He successfully detected the illegal additive down to 1 part per million. And with one alteration — placing the diatomite inside tiny, microfluidic channels rather than on glass plates — the tool can be used with even greater sensitivity to detect illicit drugs in urine, saliva, or blood. And it may be a boon for forensics. Humans quickly metabolize most drugs; after 24 hours, their levels fall below the detection threshold of most biosensors, according to Wang. “But if you can trace drug use back 40 or even 48 hours, law enforcement could gather important evidence in DUI cases or when drug use is relevant to a crime,” he said. Wang believes strongly in the technology, and so do agencies like the National Institutes of Health and the U.S. Department of Agriculture, which continue to support his work.